The plan was pretty much exactly the same as Boxing Day. 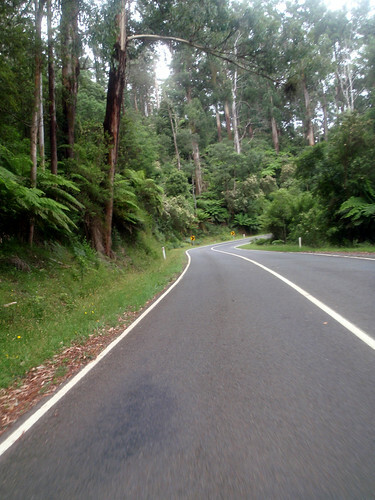 Park at the bottom of Mt Donna Buang, then ride up/down it 3 times. After the 80km drive, I parked and got my bike out to assemble it. 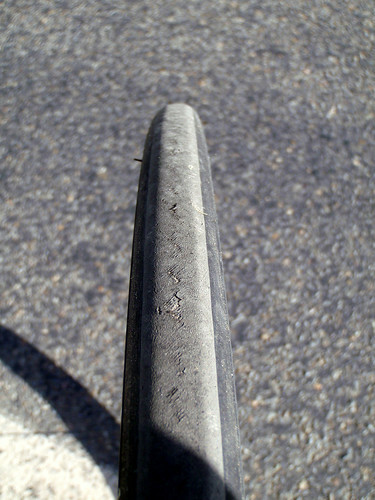 It was then I noticed my front tyre was showing signs of being very much at the end of it's life. At this point I knew I could pack up and drive all the way home, or try riding on it and hope for the best. I shoved a pair of tubes in my back pocket and mounted up with BJ and Justin, "might as well try it and see" I thought. Andy (Naylor) had given me fairly clear instructions to take the first ascent moderately easy, giving my trashed (and freshly massaged) legs some time to settle in. The instructions were forgotten around 5km from the summit, when I decided to chase down and hurt Justin. The next lap I took a bit easier, riding with Justin while BJ tempo'd off up ahead. The final lap hurt. 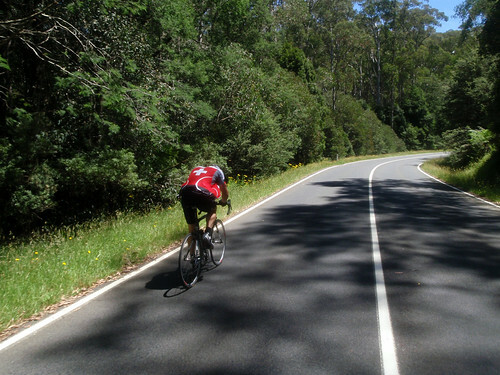 I rode off the front of the other two about 5km in. Slowed and regrouped with BJ at Cement Creek before tempo'ing off from him around 5-6km from the summit. Once at the top I did a quick u-turn to find and pace Justin. I almost wish I hadn't, he finish hard, breaking BJ (who'd done the same as me) and almost putting my legs into cramps. The first lap was by far the quickest, matching the faster laps of Boxing day. The second two were far slower and despite being remarkably similar in time, were worlds apart in terms of pain. Overall I think it was a reasonable result considering the state of my legs and the lack of pacing such a small group provides.